This page focuses on headlights To See With and illuminate the road ahead for long-distance cycling, including dynamo-powered and battery-powered options. Many people have successfully done self-supported, ultra distance bikepacking races without a dynamo hub, instead using battery-powered lights, backup batteries, and wall chargers. However, the majority of racers prefer to have a dynamo front hub to power their lights so that they have no concerns about charge levels. Compared to using a standard hub, the slight extra drag caused by a dynamo hub decreases predicted average speeds by about 0.1 kph when no lights are on and no devices are charging, and by about 0.4 kph when something is connected (see the Mechanical Resistance page). Specific models of dynamo hubs are discussed on the Wheels page. There are several good dynamo-powered front lights available. The most popular models are the SON Edelux II, the Supernova E3 Pro, Exposure Revo, Busch & Müller (B&M) Luxos U (pictured below), and B&M Lumotec IQ-X. I’ve used the Supernova E3 Pro, B&M Luxos U and B&M Lumotec IQ-X, plus a couple of more basic models. The Supernova is very bright, but I don’t like the narrow beam shape. The Luxos U has a much wider beam, which I prefer, but doesn’t have as much reach to light up more distant objects. The Lumotec IQ-X is supposed to be better and more powerful than the Luxos U but I didn’t like the narrower beam shape and it constantly flickered in the near-field (even after getting it replaced under warranty and trying it with multiple different wheels). See Peter White’s website for images showing the beam shapes of many dynamo-powered lights. Supernova have sponsored the Transcontinental Race since 2014, and typically give participants a 40% discount on their products. Contact Supernova directly to benefit from this. One downside of using either the Supernova or the Exposure front lights is that you can only use their matching taillights (see below). In addition to Supernova selling the E3 Pro front light, they also sell the E3 Triple v2, which is brighter but is designed for mountain biking so there is no beam cut-off at the horizon, allowing the light to be projected in all directions. It therefore doesn’t pass the German laws for bike headlights as it may bother oncoming drivers. The other lights mentioned here all have a very distinct upper cut-off. The B&M Luxos U has one feature that the other lights don’t have, which is an integrated USB output. Separate dynamo-powered USB outputs can be combined with any of the other lights (see below), but having an integrated light and USB output simplifies things slightly and may save some money. 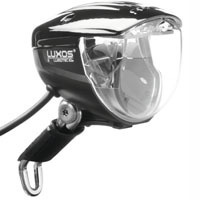 The Luxos U also has a remote button that can be mounted to the handlebars to turn the light on and off, and also switch it temporarily into a higher-power mode. Each of these headlights has failed during use for some people. There doesn’t appear to be any model that has significantly better reliability than any other, particularly because the frequency of such reports for each model needs to be combined with the number of people using each model, which is difficult to know. The main thing to learn from these reports is that you should be equipped with a backup plan for lighting and device recharging in case all or part of your dynamo-based system fails. Most dynamo-powered headlights use the same style of mount and many different mounting brackets are available (except that the Exposure light is only compatible with the Exposure handlebar mount, no fork mount is available). A particularly adjustable and rigid model for mounting the light at the top of the fork is sold by Supernova, but B&M also sell a large range of shapes, including one designed for handlebar mounting. There are many options for bright, long-lasting, battery-powered lights, but I have far less experience with them. Many battery-powered lights are more intended for mountain biking and so project light in all directions; the more road-based models restrict the amount of light projected above the horizon to avoid blinding oncoming drivers. If I did choose to use a battery-powered light then my first choice would be the Exposure Strada (shown on the right) due to the quality construction, light output, and battery life, but there are certainly cheaper options. It should be easy to find websites that compare the multitude of battery-powered lights. As mentioned above, any lighting system can fail, so it is sensible to have a backup. I therefore carry a moderate-strength battery-powered headlight, the Exposure Sirius as a backup for my dynamo lighting. This is a reasonably-good standalone headlight, but can also be used together with a dynamo headlight, for instance on twisty descents. I normally keep it on a handlebar mount, but I can also put it on my helmet mount, where it works well to illuminate the insides of corners on descents and to light-up road signs or other items on the side of the road. In addition, if I have a bike problem that needs to be fixed or I need to setup camp in the dark then the helmet-mounted light is extremely useful. There are many similar lights available from other brands, with the range of mounting options often being an important differentiating factor. If using aerobars, you can buy or fabricate a bridge that goes between the bars and provides additional space for mounting lights (e.g., the XL UCM by Profile Design, Amazon). Other mounts exist that attach directly to the handlebars that give extra space (e.g., this model). Not all such models are strong enough to properly support larger lights so some modifications and creativity may be needed. This page is in the Accessories section. Devices often need to be recharged during long-distance rides, so the next page contains information about USB Chargers.